What a fantastic reference. It has allowed me to date my FED's. I was surprised to find that one dated to the time period of 1939-1941. Great work. Enjoyed your website, found some interesting information on the cameras I own. Hi. I used the Cambron TTL in the Navy. My daughter used one also when she was in the Navy. She still has hers. I think it was $99 with two lenses and a case back in the day, from Cambridge I think. Enjoyed your site, thanks. David. An amazing website for all the collectors and a great source of information. I still own a (working) Prinzflex 500 from 1971. As mentioned, this is a badged version of the Zenit B with 58mm Helios standard lens. It was sold in the UK by Dixons Photographic. I havent used it for a number of years but still check the shutter from time to time. This is a marvellous website, I have never heard of the late 20th century Zenit SLR cameras until now! Fascinating. I am also familiar with the rangefinder FED 3L & Zorki 4 cameras Good luck. 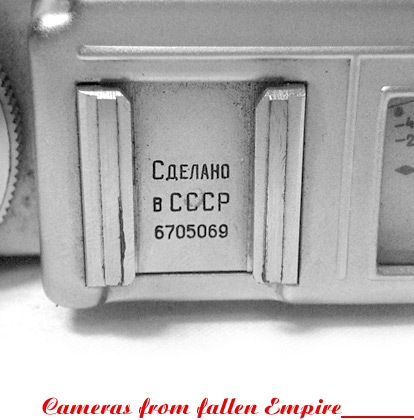 I have version of Komsomolets camera which is not presented here (just another name marking). Does Author expected information from the guests? Anyone with an interest in Russian cameras/lenses should make this site a must for information. It has helped me to accurately identify the cameras and lenses in my modest collection and I discovered that my (mint) Orion-15 in Contax/Kiev mount is somewhat of a rarity. Good job! Many thanks for very accurate and complete information. I guess there is reason why google has sovietcams on top of the list. Thanks to everybody who works for the project. Congratulations first for this admirable work of reference. Owning a MIR camera of 1960 I would remark that after the speed of 1/500 there is a last dot on the disk (without engraved number of 1/1000), and the speed selector indeed can nest there down. See the image of the manual: http://www.zenitcamera.com/mans/mir/mir. html. (I could not measure yet the speed so far). I have many Russian cameras that I was able to identify accurately thanks to this fantastic site. Accurate, informative and without equal. Highly recommended. Keep up the good work. Cheers, Peter. A great reference source identified my camera and enjoyed reading the history of FED I have a FED 1D PE0 250 camera Serial number 118577. My father bought it after WW2 in about 1947. I have the original FED 50mm f3.58 > f18 lens and also a genuine Leitz Elmar 5cm f3.5 > f22 lens. Which has been the lens predominately used. It was my first 35mm camera and I used it from about 1968. Still works and takes good crisp photos.